Huge congratulations to Peter Lofquist for a remarkable achievement this past weekend. 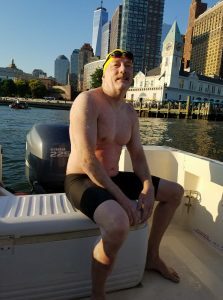 Peter completed one of marathon swimming’s great events this past weekend at the 20 Bridges swim around Manhattan in NY. 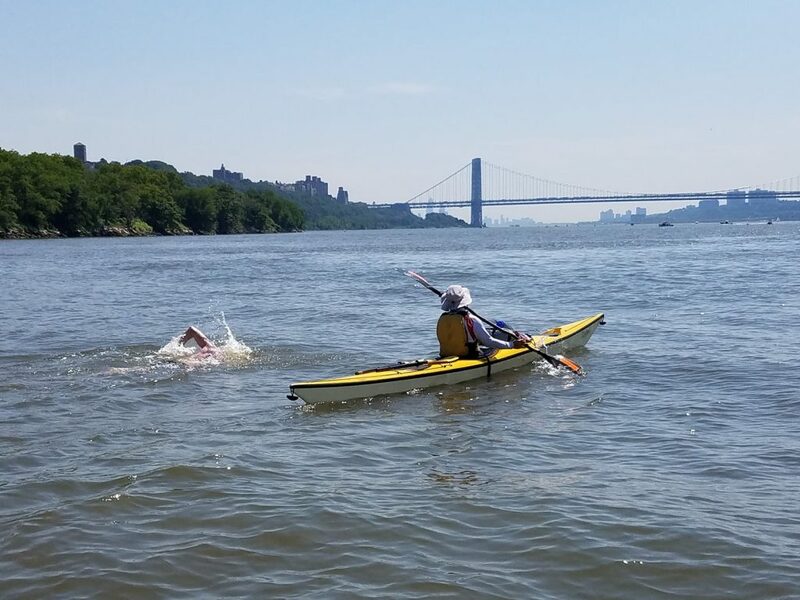 This open water swim circumnavigates the island of Manhattan and covers 28.5 miles. 20 Bridges is considered part of the Triple Crown of open water swimming with the others being the English Channel and the Catalina Channel. Peter completed the swim in 9:40 was 9th out of 15 starters! Great job Peter! This entry was posted in Athlete Photos, Results, Swim on July 4, 2018 by tekgrl_admin. Ocean swimming in triathlon can be intimidating, sure, but learning a few tricks and knowing what to expect in an ocean environment can help turn the experience into something not so bad. In fact, it can even be–dare I say–wonderful. 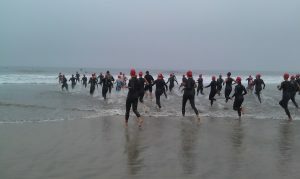 A triathlon open ocean swim is organic to the sport. 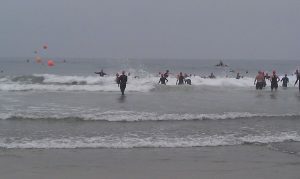 After all, this is how triathlon was born—in the waters off the coast of San Diego, California. So at some point in your triathlon career, you really must put an ocean triathlon on your race schedule. But if you’ve never swum in the ocean, the following tips might help. Unlike when you swim in pools, lakes, and rivers, something you’ll notice immediately in the ocean is the vertical movement caused by tides, swells, and waves. This doesn’t necessarily have to affect your swim stroke, but preparing yourself mentally for this unique feeling is important. In calmer seas, the water will roll underneath you, almost like you’re being carried. The key is to stay relaxed and go with the flow. Keep your fingers loose during recovery and also on extension as your hand enters the water and moves forward. This is not your normal surf entry! 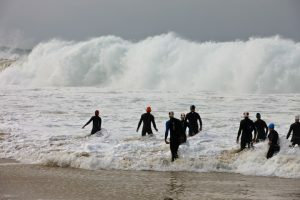 This wave and many others like it were caused by a tsunami that moved into Newport Beach in 2009 just in time for the Pacific Coast Triathlon. And no, we did not end up swimming. They changed it to a duathlon. If the seas are not so calm—like if you’re swimming straight into wind chop—granted, it’s no fun, but the key is to keep from fighting the water. Remember, your goal is to continue to slice through the water with a relaxed recovery, easy kicking, and executing an even roll of the head to breathe. Don’t try to swim “over” the chop or fight to stay above it. Let your entry arm angle in and slice through beneath the surface, just like always. For breathing in conditions like this, you might try looking backward and up a little to assist with a clearer breath. The visual for this is “breathing into your armpit.” That space is usually a good go-to place for a breath in rough water. You’ll notice that you’ll ride higher in salt water than fresh water, so ocean swimming is great in terms of buoyancy. However, this also means you’ll have an unfamiliar taste in your mouth due to the salt. If you’re doing an ocean race, try to arrive at least the day before, so you can jump in the water ahead of time and get used to this new taste. If not, there’s usually room near the start on race morning to wade in and swim a little. Ocean currents are something you’ll definitely need to think about prior to race start. They often run parallel to shore, so if they’re moving the same direction as the swim course, you’ll need to factor this into your swim start position. If you’re swimming in California, for example, the swim course might take you through the surf to the first turn buoy and then make a right turn (north) and follow a parallel route along the shore. The current, very often, will be running that same direction (south to north). In this case, you’ll have to walk further south (away from the swim start) to begin your swim because the currents will be pushing you towards the turn buoy. If you start directly in front of the first buoy, there’s a good chance you’ll be pushed too far up course, and you’ll have to turn back and swim against the current in order to round the first buoy. If the race is large enough to have multiple waves of athletes, watch the groups that start ahead of you. See where they line up. 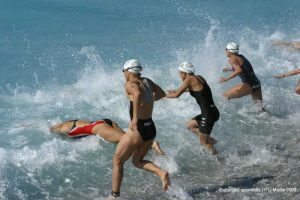 Often, race directors will adjust the swim start position, too, to account for the strength of the current on the day. 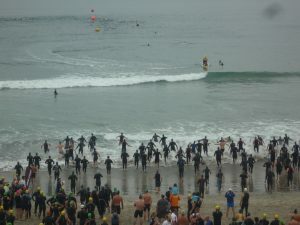 Another unique aspect of ocean swimming is the surf entry. Ocean swim courses are often set up like a rectangle. You’ll have to swim straight out to sea and through where the waves are breaking (the short leg of the rectangle), in order to get to smoother water on the other side (the long leg of the rectangle). There are several ways to do a surf entry. I’ll start with the most basic and advance from there. The first, and most basic way to get through the surf, is to wade in, and when a wave approaches, turn sideways. Depending on the size of the wave, you might jump up, but you don’t have to for the smaller waves. You’ll be vertically oriented the whole time, like you are when you’re standing. The reason you turn sideways, rather than facing the wave with your torso, is to present a narrower cross section of your body to the wave. You’ll slip through much more easily this way. You can then continue walking and/or swimming and then jump/slide through the next wave. The next method is to duck under the waves as the whitewater approaches. You’ll still be vertically oriented, but you’ll tuck your legs (squat) and duck your head underneath as the wave passes. You’ll want to grab onto the sand below you, if possible, to help hold you in place. Just know there’s a chance you’ll be pushed backwards by the waves because you’re still mostly upright when you do this. The preferred method is to dive forward under the waves. As the whitewater approaches, dive just in front of the wave, grab a hold of the sand, and lay in a prone position on the bottom as the wave passes. You can then pull your feet underneath you and stand up. To take this to the next level, you can do something called dolphin diving. This is when you dive under a wave, hold onto the sand, pull your legs under you, and then spring upward and forward in an arc. You’ll be launching yourself directly into another dive under the next wave. This will end with you holding the sand on the bottom once more. Usually, three to five well-connected leaps can get you through the ocean break. This is, by far, the fastest method of entering the water through surf. Take some time the day before your race to practice these techniques. You’ll feel much more comfortable with just a little preparation. And ultimately, it will help you to relax into the ocean environment and enjoy one of the best aspects of triathlon that the sport has to offer. This entry was posted in Swim, Uncategorized and tagged Ocean swimming, ocean swimming in triathlon, ocean swimming technique, open water swim technique, open water swimming on May 25, 2016 by tekgrl_admin. 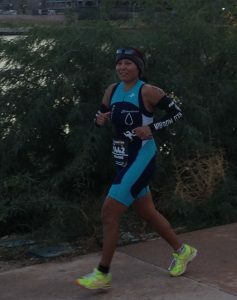 Ironman athletes dutifully executing strong kicks. You grab your kickboard, you push off, and you kick like a maniac. Some of you kick in place. Some of you inch forward. For the luckier ones, you make decent forward progress, but watch in despair, as your brethren with a swimming background move ahead of you with apparent ease, leaving you flailing in an attempt to keep up. Which you don’t. I’m sure many of you have uttered these words or something similar at some point in your triathlon careers. But then, think about this. You’re going to add arm movements to this very same kick, the one that is getting you nowhere and exhausts you. Arm movements that in terms of net propulsion allow you to move forward—hey! I’m moving forward—so it’s all good. Why, oh why, would you do this? How do you forget so quickly that you go nowhere with your kick alone, and yet, you add your arms and everything’s all right now? Here’s a blinding flash of the obvious: Triathletes who do not come from a swimming background often have inefficient kicking mechanics. And, based on my last eleven years of coaching, most do not have efficient kicking mechanics. The reason you stay in place or barely move forward when kicking is that you’re creating just as much drag as propulsion. The solution? You obviously need more kicking sets. Just kick harder. Longer. It will work itself out. But for many, it does not work out. I talk about how to learn an efficient kick below, but in the meantime, for reasons of drag reduction, kicking less might not be such a bad thing. True. But you’re also not creating as much drag. Both of these things, kicking less and reducing drag, mean you don’t have to work as hard. 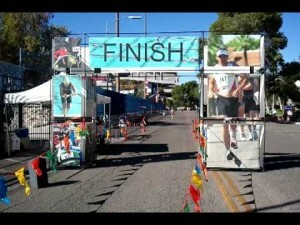 Am I a proponent of two-beat kicking for long course triathletes for this reason? You betcha. Kick once per stroke—one leg kicking, while the other remains in streamline, nice and straight—a tight, hydrodynamic position that doesn’t create excess drag. Even a four-beat kick or a controlled and well-timed six-beat kick would be better than random splashing and flailing. An integrated kick movement is an extremely powerful thing if harnessed correctly, and that’s the subject of the next blog article. But in this article, we’re talking drag reduction only. Sort of like polishing the seat on a chair with only three legs . . .
Am I ranting? Oops, didn’t mean to. Quiet, nerdy coaches don’t rant. Is a good catch important? Heck, yeah! And I love working with athletes on their catch. It’s that fun stuff you get to do once the foundation is in order. But for 99% of the athletes I see for the first time, the foundation is not in order. Things like . . . a streamlined, hip-initiated kick. But before I go further, I want to say this. Is there value in the propulsion created by kicking hard in a 200-meter swim race? Yes. This is a short event and my assumption here is that the competitive swimmer who races this distance does so with an efficient kick. You see this even in long distance swim races, like the 1500-meter freestyle, when the kick really “kicks” in for the last 50 meters or the last 100 meters, because the swimmer can move faster this way for that short burst of speed to the finish. Which brings up another important point. Do competitive swimmers adjust how hard they’re kicking depending on the distance they’re racing? I think even the layperson could answer that. Swimmers racing a 50-meter race or a 100-meter race look different than the swimmer racing a 1500-meter event, do they not? So even in a sport so dominated by this need for powerful, strong kicking, even here, adjustments are made to accommodate for distance. So, if you’re a triathlete . . . who swims 3800 meters . . . who is in the water for an hour or ninety minutes or more . . . who must mount a bike after swimming and begin a further eight to fifteen hours of fat-burning-yet-glycogen-dependent athletic endeavor . . . are you going to kick like you would for 200 meters? Heighten your awareness of how much kicking you’re actually doing. First, it’s important for you to tune into what you’re feeling in the water. What does it feel like to be streamlined and hydrodynamic? I often tell my swimmers to envision a shark. They swim with lethal ease don’t they? Millions of years of evolution behind a shark’s movement to help it swim efficiently. A single flick of the tail and they change direction, right? They move purposefully, stealthily. If a shark is spastically flicking its tail, creating bubbles and whitewash, it’s probably dying. So the next time you’re in the pool, pay attention. 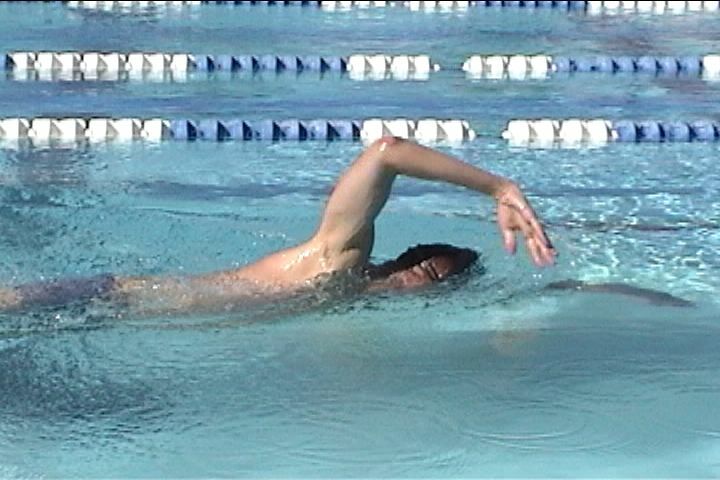 Push off in a nice tight streamline, legs straight, feet together, toes pointed, and enjoy that sensation of slicing through the water, nothing impeding your forward progress. And then—dare I suggest it—try stopping your kick between strokes. Just stop kicking and see what happens. It might just be for a micro-moment, a tiny beat in the many beats of a stroke cycle, but one that won’t create drag if your legs are straight and together and toes pointed. And this is for feel, mind you. Are you ever going to stop dead in the water when you’re swimming normally? No, of course not. But we get in this panicked habit of always kicking, always thrashing around on the back end, and we don’ t even realize we’re doing it. If you find my streamlining experiment difficult—many other balance issues might be at work here—try it in your wet suit. It’s amazing how many triathletes’ breathing problems have been miraculously solved by allowing their legs to float in a wet suit. I say “float,” because this is what I tell swimmers to do sometimes—stop all movement and just use the arms—which means they usually don’t stop kicking, but they do kick less, which is the point. After heightening your awareness as to the amount of kicking you’re doing, the second piece is to learn to kick from the hip, so that the motions you are making, regardless of the frequency and intensity, are at least close to a proper freestyle flutter kick. The vertical kicking drill is a great drill to address a hip-initiated kick movement. Begin in deep water, body vertically oriented (like you’re standing), hands across your chest, and kick in place. You should strive to draw your leg back in a straight manner (no bend in the knee) behind your hip to initiate the kick, then bend your knee, then sweep the thigh forward and snap the leg straight, finishing with a pointed toe. The legs should move in an equidistant manner fore and aft of your longitudinal centerline. Sweep the leg forward as if scraping your toes along the bottom of the pool. Don’t lift the thigh, like you’d do in a running stride, but sweep it forward. If you’re doing the drill correctly, you should be able to keep your head above water and remain in place. If you move backwards, you’re kicking too much in front of you—not pulling your legs behind your hips to initiate the movement. If you sink—and many of you will the first time you try this—you are probably kicking at the knees only. Try big sweeps of the legs, like doing the splits, just to bring your awareness to the pivot point of the kicking action, which should be the hips. Once the pivot point is assured at the hips, you can reduce the amplitude of the kick. I think the old adage, “work smarter, not harder,” is applicable here. So before you resign yourself to swimming into that proverbial brick wall with heart-pumping, glycogen-wasting kicking, remember what you’re training for, and then seek to do it more efficiently. This entry was posted in Swim, Uncategorized and tagged 2-beat swim kick, swim technique for triathletes on February 19, 2015 by tekgrl_admin. 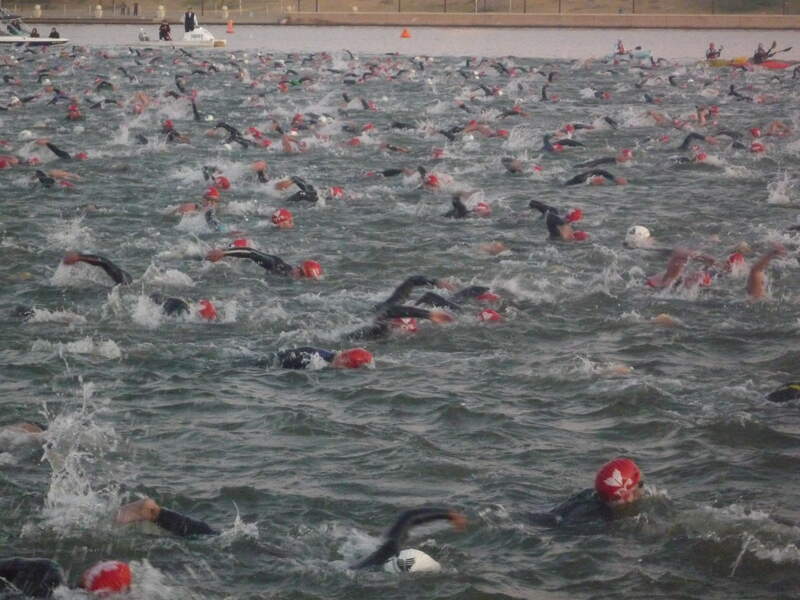 We would probably trade our first born for an open water swim that looked like this. Some swimmers actually get to experience conditions these, the ones leading the race, like an Andy Potts or a Lars Jorgenson, once they’ve broken away from the pack. It’s sort of not fair, is it? But since this is our reality, let’s focus on ways to cope with the challenges we face in a mass open water swim. These tips are applicable to anyone, but I’m primarily focusing on those of you who are just trying to get through the swim, those with the goal of making it out of the water without a panic attack. 1. When you first enter the water and duck your head under, give a good exhale, like really good. Make it long. “Empty” the lungs. This will ensure that the first breath you take when you surface is a deep one. When we get anxious, the breaths come shallow and fast, moving only “dead” air up and down the trachea—i.e., nothing happening at the cellular level in the alveoli where the oxygen transfer takes place. 2. Exhale adequately. Most breathing, and thus, anxiety problems are due to an inadequate exhale. Maintain a slow exhale through your mouth and/or nose when underwater, a light bubbling. Humming is a good way to remember to exhale. This also keeps the exhale at a slow rate instead of a too-forceful blast. Also, you want to hear the sound of air leaving your mouth and/or nose as you roll through the surface—i.e., don’t stop your exhale prior to clearing the surface. This way, the subsequent inhale comes in automatically. If you are actively thinking about inhaling, then something is wrong with the exhale. 3. Swim with your mouth loosely open underwater. After inhaling with your mouth, there’s really no need to close it—it’s just an extra step. This will help relax the facial muscles, reducing fatigue and tension. When you clamp your mouth down hard underwater, puffing out your cheeks, you’re creating gobs of tension. You can bring your lips together slightly on the roll up to breathe to keep the water out of your throat. To learn about this in more detail, click here. 4. Relax your recovery. So much extra tension is carried during the recovery phase of the stroke. The recovery phase is the part of the stroke where your hand exits the water after pulling to where it enters the water for the next stroke. Your forearm should literally hang from your elbow as the elbow moves forward. The forearm should be limp, the wrist limp, the fingers loose. To read more, click here. 5. Fingertip drag. This is a great way to practice a relaxed recovery. Let your fingers drag gently in the water as you swim to remind yourself to relax the recovery. You can do this in the pool in your workouts, but also, you can do this in the race, either when warming up beforehand or in the first several yards of the race. Keep it easy. Keep it gentle. More here. 6. Relax your extension. This is common—swimmers, crazy with rigidity, driving or spearing their arms forward when entering the water following recovery. The extension, just like the recovery, should be tension-free. 7. Pull your wet suit away from the neck to let water into the torso area. This might help relieve the pressure you feel of the suit against your chest. Do this just after getting in. 8. Don’t kick. Like literally. Especially when your goal is just to get out of the flippin’ water. When you’re in a wet suit, there is no need to kick. Let your legs float behind you. Usually, when I tell my swimmers not to kick, their legs still move, but in a very small way just for balance. You will save buckets of energy if you do this. I can’t tell you how many of my swimmers have found instant relief in this. You do not have to kick, no matter what anyone tells you. Other swimmers and coaches with competitive swimming backgrounds will swear up and down that you MUST kick. Well . . . you don’t. 9. Do 2-count breathing instead of 3-count breathing. Again, I hear this all the time, that you MUST do 3-count, or bilateral, breathing. No, you don’t. Two-count is perfectly acceptable and brings you to oxygen sooner. When we fall behind on our oxygen intake, we get tensed, anxious, and panicked, lifting our heads and flailing, and it’s often because we’re trying to stick to a 3-count breathing pattern. Yes, there are many advantages to 3-count breathing, but really, the need for oxygen and a relaxed, sustainable breathing pattern trumps everything. Read in more detail here. 10. Go with the flow of contact, meld with it. No matter how well you seed yourself, you’re going to have contact in the swim. If you your arms get whacked or someone swims over your legs or whatever, let your body be spaghetti, keep the arms turning until you’re clear. Never push back or “fight” the contact. 11. Know that breaks are allowed. You can rest vertically oriented, head up, as the wet suit floats so well, using no more than light scull. Or, you can rest on your back, take several composing breaths, and then be on your way. Or, if you’re really desperate, hang onto a kayak or raft. As long as you don’t make forward progress, it’s legal. 12. Use a tempo trainer. These are little metronomes that you clip onto your goggle strap or tuck under your cap, and you can set them to beep at a specific stroke rate. 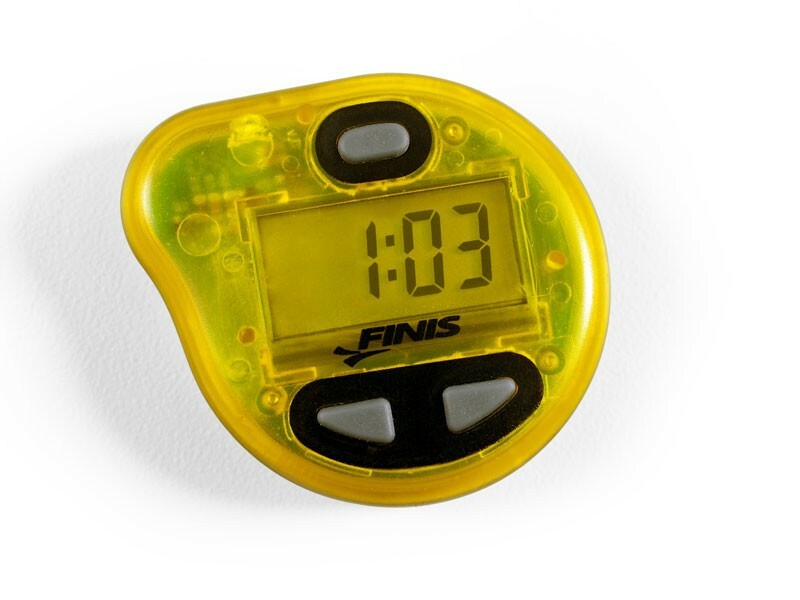 When you use a tempo trainer for the purpose of helping you remain calm in the water, match the stroke rate on the tempo trainer with a relaxed, sustainable stroke rate you’d like to keep for your race. Concentrate on the beeps, the rhythmic nature of it, the steadiness of it. One arm entry for each beep. 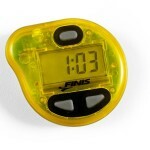 Tempo trainers are made by Finis, if you’re interested. 13. Utilize the practice swim time, if offered. 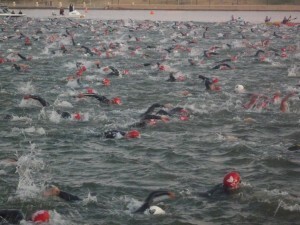 It depends on the venue, but sometimes set hours are offered to swim the course or part of the course in practice in the days leading up to the race. If it’s offered, take advantage. It’s a great way to get some of the race day jitters out ahead of time. 14. Arrive early. This should be a no-brainer, but arriving late is a huge stress inducer that leads to anxiety in the swim. 15. Practice in the open water. A given, but the more you do it, the easier it becomes to relax in an open water environment. 16. Practice in your wet suit. Do not be that guy who shows up to the race, un-worn wet suit in hand, price tag still attached. Similarly, even if you’ve owned a wet suit for a while, prior to a race, ensure you have swum in it recently. Often, we squeeze into this constricting, claustrophobic, choking piece of rubber on race day and it’s been months since the last time we’ve last worn it. Ugh. Whether in the pool or the open water, gaining time in your wet suit helps with relaxing come race day. I know wet suit companies say not to wear your suit in the pool, but just so you know, I’ve done it for years, carefully rinsing them after, and the suits have come out of it just fine. 17. Give yourself plenty of time to put on your wet suit. Sort of like arriving early, you want to start this process with enough lead time that you don’t feel rushed. Twenty-five to thirty minutes ahead of your race start is not too far in advance to be putting on your suit. If it’s hot, leave it rolled down at the waist, but at least have the legs on and everything pulled up high in the crotch (crass, I know, but it is what it is) so the suit doesn’t pull down unnecessarily on your shoulders once you have the top on. 18. Tread water gently, especially in a wet suit. This is applicable with deep water starts, where you need to float for a few minutes prior to swimming. So much energy is wasted here with unnecessary kicking and arm movements. If you’re in a wetsuit, you need only the gentlest of arm sculls to keep your head above water. To see what I mean, practice in water deeper than you can stand, take a breath, hold it, put your arms at your sides, keep your legs together (no movement) and practice bobbing. Be sure to notice, to internalize, that when your head drops below the surface, it pops right back up. Add a slow bubbling of air out of your nose and relax. 19. Stop when the starter says go. Yes, you’re rarin’ to go, you’re tapered, you’re rested, you are on. It’s easy to get carried away, starting way faster than you should, your oxygen needs quickly outpacing your oxygen supply. But if you’re trying to remain relaxed, attempting to get through the swim without panicking, you can afford to stay put, while everyone else takes off. Seed yourself well (in the back or to the sides) so you don’t get run over, wait for the gun to go off, then hang out until some space clears, and you can be on your way. 20. Be where you are. Sounds like a Bruce Lee quote, right? But hear me out. Rather than finding yourself in the middle of a swim and thinking, “Holy crap! I’m in the freaking middle of a BIG freaking lake, with no bottom, no sides, nothing to hold on to, *!$@!,” shift your thinking to where you are, to the two or three feet in your immediate vicinity. Think about a technique item, a relaxed recovery, an easy entry, loose fingers, focus on a good exhale, count the number of strokes between sighting for the next buoy. You want to get to a place mentally where it feels like you’re swimming on a treadmill, happy with where you are, not desperate to get somewhere else. By employing some of the suggestions above, you just might find yourself using the words open water swimming and enjoyable in the same sentence. Now, wouldn’t that be something? This entry was posted in Swim, Uncategorized and tagged calming techniques for open water swimming, open water swimming, triathlon open water swimming on August 7, 2014 by tekgrl_admin. It’s easy to get bogged down in the technicalities associated with executing a proper swim stroke recovery and forget the guiding principle behind it. And that is . . . wait for it . . . to recover. From the time your hand exits the water to the time it enters, you are giving your arm the opportunity to rest. Or, you should be. 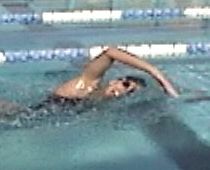 There is nothing to be gained by tension in the arms during the recovery phase of the swim stroke. Nothing. Why do we carry tension in the recovery? I can understand why it happens. You rush out of the office, drive to the pool in traffic, forget your swim suit, curse yourself for your stupidity, drive home to get it, curse yourself again because of all the planning you did to try to get ahead of the game and bring your swim stuff to work and it was all for naught, you finally arrive at the pool, dash into the locker room, check your watch, 30 minutes until your conference call, suit on, cap on, goggles on, sprint out to the pool, every lane full, ask first person if they mind circling and they say yes, crap, move to next lane, person floating on a noodle, can I share a lane, well, yes, I guess you can, you shrug, better than nothing, jump in, first lap, goggles leak, check watch, 20 minutes left, screw the warm-up, screw the drills, I need a workout damn it, 10 x 100 on 1:30 go, go, go, drive that hand into the water, spear it hard, pull like the devil, whip hand past the hip, contract every arm muscle you have and throw the arm forward again, yes, yes, yes, you’re working hard, squeezing every drop out of your limited swimming time, breathing in gulps, you drive your hand into the wall on that final stroke. Done! Yes! Another successful swim workout! Ok, then. So let’s breathe in deeply . . . hold it a moment . . . there . . . now let it go . . . slowly . . . ahhhhh. So, yeah, there are many reasons a rigid recovery happens, none of which will benefit you in the long run. And let me emphasize, lest you think otherwise, a tense recovery will not help you swim faster. It will help you fatigue faster, but that’s about it. After you finish your pull, think of “releasing” your arm into recovery. Don’t pull it, lift it, throw it. Release. Let your elbow guide the recovery movement. Your forearm, hand, and fingers should hang from your elbow like a marionette arm. Loose. Relaxed. Like spaghetti. Resting. Recovering. When it’s time to enter, should you drive, spear, and grunt? No. Let your hand drop, slide, glide. Use gravity. Your hips and elbow are high. Use this potential energy. Let it all drop and your body will transition to the other side. You know that fingertip drag drill your coaches always have you do? One of the many benefits of that drill is learning how to relax the arm during recovery. Your fingers should lazily drift through the water as they move forward. How relaxed can you make this movement? A drag and a drop. That’s what it should feel like. Slow down the recovery, drag and drop. Easy. Relaxed. Warm-up is an ideal place to practice the fingertip drag drill. When you need to come down from work or whatever else life has thrown at you that day, do fingertip drag. For example, swim one length fingertip drag, followed by an easy length of quality freestyle, focusing on a relaxed recovery, on the way back. You can even do a few lengths of this this between your main sets to remind yourself to let go of the tension. This isn’t just about the stroke looking pretty, it’s about energy management. Accumulated fatigue. Don’t let needless tension gobble up precious glycogen and fry your arms. Relax. And do what the stroke says you should. Recover. 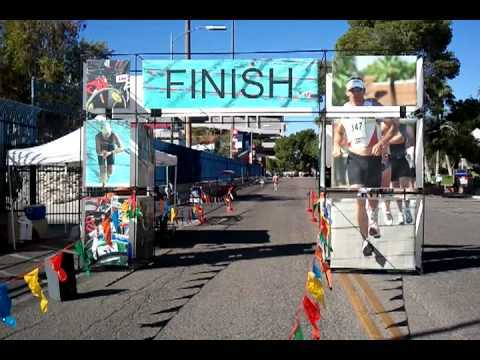 This entry was posted in Swim, Training, Uncategorized and tagged Olympic stroke technique, swim recovery, swim stroke technique, swim technique for triathletes, swimming on July 22, 2014 by tekgrl_admin. Should swimming hard look hard? 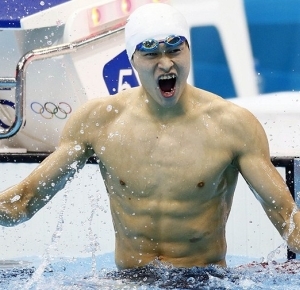 Sun Yang, 2012 London Olympics. Photo by Rob Schumacher-USA TODAY Sports. Swimmers are a hard lot. We enter the pool at 5:30 in the morning, swim massive yards—swim them hard—and then do it again in the afternoon. We do it day after day. No easy sets. No extra rest. All pain. All guts. No glory. The only easy day was yesterday and all that. Right? Because to swim fast, we must do the following: Kick hard. Pull hard. Train hard. Swim hard. Race hard. I know because I’ve been there. I swam for thirteen years with Bob Gillett, who famously coached Misty Hyman to a gold medal in the 200-meter butterfly at the 2000 Sydney Olympics. In the early seventies and eighties, big yardage was the name of the game. As a seventh grader, I walked to school each morning after an 8,000-yard swim practice with wet hair and a tired smile, having derived a strange, masochistic pride from this, from working hard. If you are, or were, a competitive swimmer, you know exactly what I’m talking about. Then, after school, I got back in the pool and did it again. Day after day. Same thing. And this continued into my years as a collegiate swimmer at the U.S. Naval Academy. So I get it. Working hard. I really get it. I think we all carry an innate sense of what working hard looks like. In swimming, the rooster-tailed, ferocious kick is a telltale sign that a swimmer is indeed working hard. Those of you who have been coached by me, know I’m enamored with Sun Yang, the current world record holder in the 1500-meter freestyle. Why? Because he’s turning traditional thinking for how to go fast on its head. He’s doing what 99 percent of swim coaches in the world say you shouldn’t do, even for a distance specialist: He doesn’t kick enough. When he swims the 1500, he uses four kicks per stroke cycle. Only four. And at the London Olympics in 2012, where he breaks his own world record, there were plenty of times during his swim when he used only two kicks per stroke cycle! Check out the video. Watch it for yourself. This mindset of swim hard, kick hard, etcetera, is well ingrained in swimmers from the time we are small. But rather than try to describe this, I thought I’d let race commentary speak for itself. I’ve excerpted much of what was said by two Australian commentators during Sun Yang’s historic swim at the Shanghai Aquatics Center in the summer of 2011 when he broke Grant Hackett’s 10-year-old record in the 1500-meter freestyle. The announcers, Nicole Livingstone, an accomplished Australian Olympic swimmer, and Anthony Hudson, an Australian sportscaster, are incredulous—incredulous—when calling Sun Yang’s performance. Particularly in Nicole’s case, it goes against everything she’s been taught, everything she knows. And the thing is, I get her. I understand the deeply-rooted psyche of a competitive swimmer, who grew up swimming when I did, who was successful because of the hard work and countless yards she put it in. During the commentary, you hear it in her voice. In the inflection, tone, and cadence. I’ve tried to highlight those moments in the text below by italicizing when she emphasizes certain words. Simply put, her reaction is a telling statement on the swimming community’s collective mindset of what it looks like to go fast—it should look hard, as evidenced by a strong kick, of course. This particular video clip begins 4:27 into Sun Yang’s swim. For reference, the announcers’ words are written in blue. My comments are in black. The first time listed is the elapsed time in the video clip itself. The second time is Sun Yang’s running swim time. And finally, I’ve indicated who is speaking. I’ve not bothered with proper punctuation, truncating where necessary for brevity. Notes in brackets within the text of the commentary are my own additions. A high heads-up swim position used to be the norm, so it’s not surprising that Nicole would use the term “buried” to describe a head position where the head is straight and aligned with the spine. :10/4:35/Nicole: here’s the underwater, so nice elbow. Look at the pitch on the elbow! Much of the post-race analyses I’ve read regarding Sun Yang’s races focus on his high elbow catch underwater. Indeed, this is brilliant. He is strong and fit and has trained countless yards to be able to hold this high elbow positioning during the catch for 1500 meters. True, it does look like there’s a lot more going on in the pool a few lanes over. If Ryan was leading at this point, it would be “well deserved” because it looks like he’s working hard. Nicole describes Sun Yang’s crisp, integrated kick as legs dragging or floating five different times in the commentary. 1:33/5:58/Nicole: nice high elbow. The pitch on the elbow is just so dramatic. 1:37/6:04/Nicole: so the arm is extended and it’s from the elbow to the hand that bends all the way down underneath him and then the rest of the arm follows to finish the stroke. It’s just phenomenal. Nicole loves a good catch. Now that is hard swimming. 1:58/6:15/Nicole: and the amount of work that he would do in the training pool with Denis Cotterell [Sun Yang’s coach and also Grant Hackett’s coach] to be able to race a fast 1500, is somewhere around 30 hours a week in the water . There’s a lot of cross-training that goes on, as well, these days. So he would be a very fit boy . . . very swimming fit and water fit, doing anywhere up to 100 kilometers a week in the water . . . for just 1500 meters. Nicole speaks clearly and confidently about the merits of Sun Yang’s catch and also about his training and high volume. True, good technique needs many yards behind it to do what Sun Yang is doing. Nicole is having a difficult time reconciling what she’s seeing. Yes, Sun Yang is swimming fast. And the statement, “It makes you think like he’s not swimming hard,” says a lot. Darn it, Sun Yang. You’re supposed to look like you’re swimming hard! Don’t you understand? How can I call this race if it doesn’t look like you’re trying hard? As if he’s not working hard already. . . Of course, because of how “easy” he makes it look, she would assume his coach would say something like this. Warm-up’s over. Time to work. Hard. Neutral head position. That’s a real humdinger. Nicole at this point is desperate for some exertion. Some evidence that Sun Yang is trying. That he’s working hard. 8:48/13:13/Nicole: if he’s going to do any sort of world record, he needs to move soon. I mean, he’s running out of race distance. That’s the pure fact of it. She almost gets a little smug here. See, I told you. If you don’t work hard . . . well, that’s just the pure fact of it. 9:04/13:29/Nicole: so maybe Grant Hackett’s world record will live to fight another Olympic Games. It’s been there since 2001. She is hopeful indeed. This person, executing a ridiculously efficient swim stroke with the “dragging” legs just cannot move past a phenom like Grant Hackett, who utilized one of the strongest, sustainable kicks in swimming history. 9:13/13:39/Nicole: What’s he got? What’s he got left? Is he tired? 9:20/13:46/Nicole: Oh! There’s the kick! Finally! This is it! This is how you go fast! She is the most excited she has been the entire race. Listen to her voice. 9:22/13:48/Anthony: He’s really starting to rev it up now! Yes! He’s working hard now! This is how you swim! 9:29/13:55/Anthony: Sun Yang of China is working hard here! Anthony says this proudly. Again. Finally. Something that makes sense. Hard work. He’s kicking hard. He’s in the last 75 meters of the race, but never mind that. 9:38/14:04/Nicole: But look at the kick! I mean, he has had his legs floating for the first 1400 meters and it’s just been the most easy of strokes and now, look at the kick on him. The feet are right out of the water! Halleluiah! The kick. He has a kick! He’s less than 25 meters from the finish, and finally, he’s decided to do it right! 9:50/14:16/Anthony: Well, he’s going for it! He’s really gonna challenge here! This world record line, hopefully we’ll see it very shortly. Sun Yang of China, 14:23. We’re talking about a mark of 14:34:06. He’s gaining on it all the time! Grant Hackett will be very nervous right now! 10:07/14:33/Anthony: Oh, what a performance! He’s gonna do it! 10:21/Anthony: What an amazing way to do it, too, Nicole! 10:23/Nicole: That is just incredible. He was nowhere near it with 100 to go. I think it was 2.6 he was away from it. And the last 100 meters, he’s gone 54 flat. 54 seconds in the last 100 meters. That was incredible. Imagine how fast he could go if he tried the whole way! This is bar none the greatest line in the entire commentary. It all boils down to this in the swimming psyche. 10:49/Anthony: And what an amazing mark, 14:34:14. So Grant Hackett’s record has been beaten. It was the one that survived . . . and we were hanging on to that one. Yes, of course. It was the hard yards. 11:23/Nicole: Wow. That was phenomenal. His stroke is just so efficient. So efficient. And then when he wants to put on a turn of speed, he just brings those legs in. Look at them. They’re just floating there. And in the last 100 meters, it was 54 flat. And he’s just brought in this massive 6-beat kick. And it wasn’t even the last 100. It was the last 50. His last 50 meters was 25.9. 11:51/Anthony: It’s astonishing. As you said, he had plenty in reserve, didn’t he? If you’ve made it this far in the article, congratulations. My hope is that this will make you think about what “hard” means. Swimming like Sun Yang—executing a clean, tight stroke with no bubbles or whitewash, while maintaining a high-elbow catch—is indeed hard. It is exacting. It takes hundreds of thousands of yards of dedicated, disciplined practice. But the main point here is that a swim stroke shouldn’t look hard. If it looks hard, there’s probably a lot of extra stuff going on that’s creating unnecessary drag. Would you ever want to watch a ballet dancer that looked like they were working hard? These are some of the strongest athletes in the world, but you would never know it. Which is as it should be. Take that same example and move it underwater to your favorite aquatic animal–a fish, a dolphin, a shark. If they’re spastically shaking their tails, something is very wrong. These animals disturb the water hardly at all as they move through it, having evolved over millions of years to cut the cleanest possible line through the aquatic medium. You might see a momentary series of fast twitches of the tail if a fish needs a quick burst of speed, just like a human sprinter uses a strong kick for short periods or Sun Yang uses one to sprint home in the last 50 meters. After any quick turns of speed, however, the fish returns to a quiet, rhythmic movement, no bubbles, no splash—but they are still moving fast. What does this mean for humans? For long-distance swimmers, in particular? A savage kick on the back end might not be necessary. Denis Cotterell certainly recognized this. He didn’t force Sun Yang into a box—into doing excess kicking he clearly doesn’t need. Bottom line, swimming in a quiet, graceful way in order to go fast should be ok. The experts—that is, any fish (and one human world record holder)—will attest to this. This entry was posted in Swim, Uncategorized and tagged 1500-meter world record, 2-beat swim kick, kicking in swimming, Olympic stroke technique, Sun Yang, swimming, triathlon on May 8, 2014 by tekgrl_admin. I’m surprised how many swimmers believe they MUST take three strokes between breaths. It’s just not true. A 2-count breathing pattern is perfectly acceptable. 2-count breathing means taking two strokes between breaths, thus taking your breath on the same side each time. This does not mean two stroke cycles between breaths. A cycle consists of two individual strokes. But before I start on the pros and cons of 2-count and 3-count breathing patterns, you will notice that there is no mention below of 4-count, 5-count, or some other higher numbered breathing pattern. Usually, anything higher than a 3-count breathing pattern is not sustainable for the longer distances found in triathlon swimming events. And while I’m on the subject, always start with the breathing pattern you intend on keeping. Do not start a race with seven or ten strokes between breaths. You’ll fall behind quickly on the oxygen uptake and this usually doesn’t end well. So back to 2-count versus 3-count breathing . . .
Technically speaking, 3-count breathing is the more efficient of the two breathing patterns because the head remains in a streamlined position longer. Reducing drag is good, so 3-count breathing must be good, right? Well, if you can sustain it, then yes, 3-count breathing is fine. Go for it. But what happens if you can’t sustain it? Then 2-count breathing is a sound alternative. Ok, so let’s look at how the fastest swimmers in the world do it. Men’s 1500-meter freestyle final, 2012 London Olympics. Only one swimmer of the final eight used 3-count breathing. Seven swimmers used 2-count breathing. Occasionally, you even see a quick swing breath where there is only one stroke between breaths. Women’s 800-meter freestyle final, same Olympics. All eight women used 2-count breathing. Sometimes, you see a quick 2-3 transition, where the swimmer used 2-count breathing, but switched sides mid-pool using 3 strokes between breaths to begin breathing on the other side. These are just two examples of many where the fastest swimmers in the world use 2-count breathing. And you know what? It’s ok. If you need the oxygen, you should take it. Period. You come to oxygen sooner. This is the biggie. Fulfilling oxygen needs trumps everything! Scores of swimmers attempt 3-count breathing, only to fall behind on their oxygen intake, the stroke devolving into a panicked 2-count frenzy with lifting and lurching and who knows what else to get a breath now that they’re behind on their oxygen requirements. Far better to begin with 2-count breathing from the get-go and establish a relaxed, easy breathing pattern that is sustainable. Given a common stroke rate of one stroke per second, you are only two seconds away from your next breath at any given moment. However, if you always practice right-side breathing traveling in one direction down the length of the pool and return with left-side breathing, you will have practiced each side equally and your stroke will remain even. If you employ proper open water sighting techniques, this is a non-issue. The better the swimmer, the less the breathing pattern will factor. Better swimmers create less drag during the process of breathing, rolling more evenly on their longitudinal axes to attain the breath. So breathing more often is of little consequence with respect to creating drag. For swimmers with poor breathing mechanics, who lift the head to breathe allowing the hips to drop, or who pull laterally to breathe, pulling their bodies off a straight alignment, having the head down in streamline for a longer period of time is of great benefit. You can still practice breathing to both sides with 2-count breathing, as explained above, but with 3-count breathing, this even roll to both sides is guaranteed. Depending on venue, sighting to the sides may be the only thing you need, like if swimming in a narrow channel or river. In this case, 3-count breathing is a great help. Of course, if you’re able to breathe on both sides, even with 2-count breathing, you can switch sides at your leisure for sighting purposes. Generally speaking, however, you will still need to sight looking forward to swim the straightest line, regardless of breathing pattern. Your stroke rate might not be fast enough to accommodate waiting three full strokes until you see air again. If you are determined to swim with a 3-count breathing pattern, try increasing stroke rate, thereby reducing the amount of time between breaths, and this might allow you to do so. Intensity level also greatly affects the ability to hold a 3-count breathing pattern. And to be clear, I’m talking about intensity over longer distances, like 200 meters and up, not a 50-meter sprint. At higher intensity efforts, oxygen requirements go up, so the need for a breath sooner often requires a switch to 2-count breathing. If you lower your intensity level, 3-count breathing might be sustainable. This entry was posted in Swim, Uncategorized and tagged 2-count breathing, 3-count breathing, bilateral breathing, swim breathing, swimming, triathlon on March 27, 2014 by tekgrl_admin.